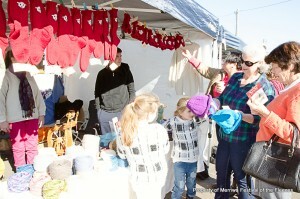 Merriwa Festival of the Fleeces is on! And so it’s almost upon us! Our community’s major event of the year is this weekend, and what a great event we are expecting. The Rosto Festival of the Fleeces will celebrate its twenty sixth year this year and the committee are hoping that it will be the biggest, brightest and wooliest ever. The Festival is the largest event for the Merriwa district bringing over 5,000 people to Merriwa each year attracting a large number of tourists from all over the state who come to experience country hospitality and an authentic rural festival… so let’s really put it on for our visitors and show them a true country experience! The Merriwa Tyre & Service Centre ‘Fashions of the Fleeces’ First Night includes a fashion parade, supported by Australian Wool Innovation and modelled by locals, a performance by top bush poet Robyn Sykes and music from party band ‘Everyday People Band’. The major fundraising raffle for the Festival will also be drawn at the Fashions of the Fleece, therefore it’s your last chance to grab some tickets and be in it to win a holiday at the Mantra Aqua Resort in Nelson Bay. Tickets are on sale now for $2 each or three for $5 and can be purchased from the Merriwa and Scone Visitor Information Centres and Council Offices until midday on Friday 10 June. Other prizes include, a one night stay at Strathearn Park Lodge, a fully packed whole lamb cut up by Max’s Country Cuts and donated by the Campbell Family of Merriwa, a Hunter Belle Cheese voucher and a bottle of boutique Orange Rose from Small Forest, and cheese platter for two and two glasses of wine at the Vines Restaurant, Hollydene. This great evening at the Merriwa RSL from 6pm, Friday 10 June is selling out so book now at www.trybooking.com/Booking/BookingEventSummary.aspx?eid=185918. Tickets can also be purchased from the Merriwa and Scone Visitor Information Centres and Council Offices and a few tickets will be available on the door. It is a big day today; Croc Stars Reptile Show, ‘ROAR’ petting zoo, Sparkles the Clown, face painting, GJ’s Laser Tag, the Waste Wrappers Show, modern day shearing demo, Pleasant View Fibers wool spinning demonstrations, City of Maitland Pipes and Drums, Vintage Vehicle, working sheep dog displays and much more. 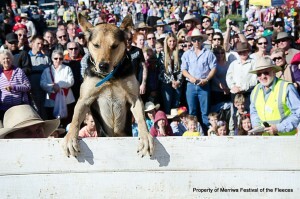 The Upper Hunter Team Penning competition starts at 8.00am and runs throughout Saturday and Sunday. 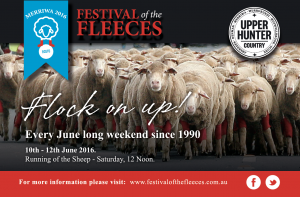 Presentations for the Festival of the Fleeces Challenge will be announced at the Showgrounds at 4.00pm on Saturday. Local Merriwa quilter Lenore Taylor has once again been busy preparing the annual Festival of the Fleeces ‘Hanging of the Quilts’ and on Saturday 11 June at the Festival you can try your luck in the Hanging of the Quilts raffle for your chance to win a beautiful hand crafted quilt made by some of the region’s best quilters. Tickets will be on sale at the ‘Hanging of the Quilts’. During the day the talents from local quilters will be displayed at the Merriwa School of Arts. This event is proudly sponsored by Gordon Martin Bulk Hauling & Lenore’s Quilting. From 3.00pm, you can enjoy watching the team penning comps, participate in the lollie scramble, hobby sheep races and if you are game you can even try sheep poo spitting! Find out who has won the colouring in competition, window display comp, best float and of course the prestigious Pam Power Award for 2016 at 5.45pm. Saturday’s entertainment ends with a bang as the skies light up with a spectacular firework display at 6.00pm. Grab a good pozzie and enjoy! Local poets are encouraged to get up and have a go at the Bush Poetry competition held on Sunday morning with a prize pool of $500 to be won. The competition will be compered and judged by Robyn Sykes the 2012 Australian Women’s Bush Poetry champion renowned for her energetic renditions. Arrive at 8.00am in time to enjoy a lovely bacon and egg roll made by the local CWA branch then settle in for the poetry comp at 9.00am.